Sometimes gaming enthusiasts are so preoccupied with whether or not they can, they never stop to think if they should. 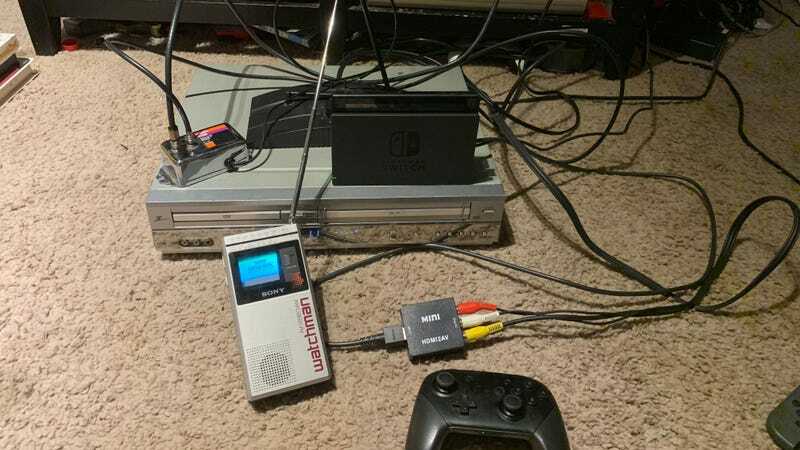 How else to explain one Smash Bros. fan’s decision to create an elaborate retro electronics setup so they could play 10 rounds of Super Smash Bros. Ultimate on the 1.8 inch screen of a Sony Watchman. Reddit user NESNerd427 recently shared a picture on the Smash Bros. subreddit of the game’s opening menu displayed on the FD-30A Watchman, one of Sony’s old portable handheld TVs from the 80s. In an email to Kotaku, NESNerd said wasn’t too difficult to do, but it did require a bunch of different adapters and cords to ultimately transmit the HD output of the Nintendo Switch to a battery-powered gadget from three decades ago. NESNerd427 started by running a mini HDMI from the Switch to an A/V converter box in order to switch from HD to analog. He then wired the converter to a 2001 Zenith DVD/VCR combo unit with a coaxial output. With a coaxial cord, NESNerd427 then ran the signal through a Cable/VCR VHF amplifier to boost its integrity before routing it through an RCA TV antenna, which then broadcast the game to channel 3 on a VHF TV and could then be picked up through the antenna on the Watchman. The signal still doesn’t travel far, so NESNerd427 said they have to keep the Watchman and RCA TV very close together. Still, it makes it possible to play the crisp, colorful Smash Bros. Ultimate on one of the worst screens ever. Because the refresh rate of the Switch doesn’t quite match up with the Watchman, there are some rogue green lines, but overall it’s a retro futurist gamer’s dream. NESNerd427 said he’s big into messing around with old electronics, including repairing stuff like old Pac-Man arcade cabinets. “I’m the kind of person that would go with a 1980s Western Electric telephone rather than a new wireless handset phone,” he told Kotaku. Naturally, trying to combine gaming’s present with technology’s past was a fun project for him.